Ohm&apos;s Law is sufficient to solve series and parallel circuits, but more complicated circuits like bridges and T&dash;networks can&apos;t be solved by Ohm&apos;s Law alone. In 1845, physicist Gustav Kirchhoff formulated a pair of laws dealing with the conservation of current and energy within an electrical circuit. These two laws together are called Kirchhoff&apos;s Law or Kirchhoff&apos;s Circuit Law. 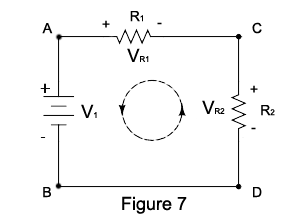 Kirchhoff&apos;s Law applies to DC circuits and, in some limited circumstances, to AC circuits. A junction where two or more components meet. A big honkin&apos; node where three or more components meet. Any path in a circuit having a node at each end and containing at least one component (such as a resistor or battery) but no other nodes. A closed path within a circuit where no component is encountered more than once. A simple path within a circuit with no branches. Kirchhoff&apos;s Current Law is a statement of the principle of conservation of electric charge. The algebraic sum of the currents entering and leaving any point in a circuit must equal zero. This means if you add up all the currents flowing in to a point and compare that value to the sum of all the currents flowing out of that point, the two values must be equal. In figure 6 below, the values of I1 and I2 entering point N must equal the value of I3 leaving N. If I1 equals 5 amps and I2 equals 3 amps, then the value of I3 must equal 8 amps. I1 + I2 - I3 = 0. Kirchhoff&apos;s Voltage Law is also called the Conservation of Energy Law. In a closed loop within a circuit, the algebraic sum of all voltages within the loop must equal zero. In figure 7 below, all the voltages must equal zero. To verify this, pick an arbitrary point on the circuit (point A for example) and an arbitrary direction (counter-clockwise). From point A, move counter-clockwise around the loop. We first encounter V1. Since we encountered the positive terminal of V1 before the negative terminal, we record the voltage as a positive number. As we continue counter-clockwise, we encounter resister R2. We reached the negative terminal of R2 first, so we record the voltage drop across R2 as a negative number. Next is resistor R1 (another negative voltage drop). Finally, we arrive back at point A where we started. The equation of Kirchhoff&apos;s Voltage Law would be: V1 - VR2 - VR1 = 0. Had we moved clockwise from point A instead of counter-clockwise, the final equation would have been: VR1 + VR2 - V1 = 0. As you can see, the absolute magnitude of each voltage is the same regardless of the direction around the loop. Only the polarity (positive or negative) differs based on the direction you choose. The Branch Currents Method can be a bit long and tedious, but it serves to illustrate Kirchhoff&apos;s Law quite well. Once you understand the Branch Currents Method, the other two methods are easy. For the circuit in figure 8 below, we wish to determine the current and voltages across each resistor. Since there are voltage sources in two different branches, Ohm&apos;s Law alone is insufficient to solve this. We must use Kirchhoff&apos;s Law. Since we don&apos;t know the cumulative effect of the two voltage sources, we can&apos;t be sure of the direction of current in each branch. We will need to make an educated guess. If it turns out to be incorrect, that&apos;s all right &dash; the equation results will point out our error. We will assume that current I1 flows from the negative terminal of voltage source V1 to resistor R1 then to node A. Similarly, current I2 flows from the negative terminal of voltage source V2 towards resistor R2 then to node A. From node A, a current I3 flows through resistor R3 until it reaches node B. Here the current divides and returns to the two voltage sources. There are two principle nodes in the figure 8 circuit, labeled A and B. At node A, two currents, I1 and I2, enter while one current, I3, leaves the node. From Kirchhoff&apos;s Current Law we derive the equation I1 + I2 - I3 = 0. 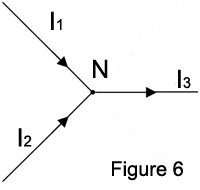 Similarly, at node B, one current, I3, enters the node while two currents, I1 and I2, leave. This gives us: I3 - I1 - I2 = 0. We can use either equation to express the relationship between I1, I2, and I3 as I3 = I1 + I2. We will refer to this equation as the current equation for discussion purposes. To derive equations for the voltage drops across each resistor, we need to first define some loops. There are two inside loops in figure 8 plus an outside loop that follows the circumference of the circuit. It turns out that we only need two loop equations, so we will ignore that outside loop. The first inside loop leaves V1, moves through R1 to node A, then through R3 to node B before returning to V1. We will call this Loop 1. The second inside loop leaves V2 traveling through R2 to node A. From here it moves through R3 to node B before returning to V2. This will be Loop 2. With these loops, we can now use Kirchhoff&apos;s Voltage Law to formulate the equations for the voltages. V1 - VR1 - VR3 = 0. V2 - VR2 - VR3 = 0. We can now rewrite the loop equations using the voltage drop equations and known component values and simplifying. Note: we can also use the current equation (I3 = I1 + I2) formulated above to substitute I1 + I2 for I3, eliminating a variable. We will also eliminate the volt and ohm symbols for clarity. I2 = 13 - 3I1. Knowing I1, we can now solve the Loop 1 equation for I2. Now, with values for I1 and I2, we can use the current equation derived above to solve for I3. We know all the branch currents now, so how about those voltage drops? Finally, what about that negative current for I2 and the negative voltage for VR2? Well, the negative signs means that our original assumption about the direction of I2 was incorrect. The current is actually going in the opposite direction. Our bad assumption also led to a reverse polarity for the VR2 voltage drop. The magnitudes are correct, just reverse the direction of I2 and you have a final solution!